For sale is a complete B Series Honda / Acura fuel system minus fuel pressure regulator. AEM B Series Fuel Rail / Stainless Fuel Line / Liquid Fuel Pressure Gauge. For Sale is a D16Y8 / Y7 Series Fuel System with. Aem D16Y8/ Y7 fuel rail. For sale is a complete D16Y8/ Y7 Series Honda Civic fuel system. "SARD" Style. MARSHALL BLACK GAUGE. 1996-2000 Honda Civic D16Y Only. A custom fuel line fitting is included for the factory fuel line, and the ends of each rail are pre tapped to accept -6 AN or 9/16”x18 fittings for users who want to use custom fuel lines. O.E. fuel pressure regulator or AEM adjustable fuel pressure regulator mounts directly to rail with no modifications. AEM includes a custom barb fitting to accommodate the factory fuel hose and the base of each regulator is tapped to accept a -6 AN or 9/16x18 fittings. AEM's Honda/Acura Adjustable Fuel Pressure Regulators are capable of supporting enough fuel flow for engines up to 1000 horsepower. Application : D16Y8 Engines. 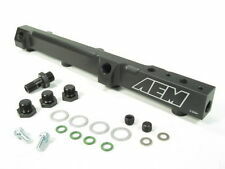 AEM Fuel Rail. OE fuel pressure regulator or AEM adjustable fuel pressure regulator mounts directly to rail with no modifucation. A custom fuel line fitting is included for the factory fuel line and the ends of each rail are tapped to accept a -6 or 9/16" x 18 fittings for users who want to use custom fuel lines. 1994 to 1997 Honda del Sol VTEC 1.6L DOHC VTEC. 1999 to 2000 Honda Civic Si 1.6L VTEC. A custom fuel line fitting is included for the factory fuel line, and the ends of each rail are pre tapped to accept -6 AN or 9/16”x18 fittings for users who want to use custom fuel lines. Fits: 1999-2000 Honda Civic Si (B16) & 1994-1997 Honda Civic Del Sol VTEC 1.6L (B16). A custom fuel line fitting is included for the factory fuel line, and the ends of each rail are pre tapped to accept -6 AN or 9/16”x18 fittings for users who want to use custom fuel lines. 2000-2005 Honda S2000 - F20C, F22C Engines. AEM 25-112BK. Works with factory fuel line or custom fuel lines. Supports fuel flow up to 1,000 Horsepower. 1/8 NPT Port included for nitrous pick up or fuel pressure gauge. For Honda Civic SI 99-00 & Del Sol VTEC 94-97. or external fuel pressure gauge. The ends of the fuel rail are tapped. OE Fuel Pressure Regulator Or AEM Adjustable Fuel Pressure Regulator Mounts Directly To Rail With No Modifications. Rail End Thread Size :-6 AN. Limited 1 Year Warrant. Comprehensive Installation Instructions, Hardware, Fittings And Injector O-Rings Included. 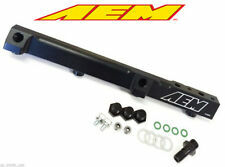 AEM FUEL RAIL 93-00 HONDA CIVIC LX EX D15 D16 25-109BK. Condition is used this fuel rail came off a 1993 1.6L D16 engine sold as is no reserve. A custom fuel line fitting is included for the factory fuel line, and the ends of each rail are pre tapped to accept -6 AN or 9/16”x18 fittings for users who want to use custom fuel lines. Fits: 1996-2000 Honda Civic (D-Series) & 1996-1997 Honda Del Sol (D-Series). AEM Electronics. Adjustable Fuel Pressure Regulator - 25-304BK. 25-304BK Adjustable Fuel Pressure Regulator 1/8 NPT port included for nitrous pick up or fuel pressure gauge. Works with factory fuel line or custom fuel lines. Works with factory fuel line or custom fuel lines. 1 x Adjustable Fuel Pressure Regulator. Supports fuel flow up to 1,000 horsepower. 1/8 NPT port included for nitrous pick up or fuel pressure gauge. Works with factory fuel line or custom fuel lines. Supports fuel flow up to 1,000 horsepower. 1/8 NPT port included for nitrous pick up or fuel pressure gauge. Thread sizes for filter are 12x1.25 top and 14x1.50 bottom for fittings (universal applications). A custom fuel line fitting is included for the factory fuel line and the ends of each rail are pre tapped to accept -6 AN or 9/16̦x18 fittings for users who want to use custom fuel lines. Except manufacturer defects. 1996-2000 Honda Civic - D16Y5, D16Y7, D16Y8 Engines. AEM 25-109BK. Works with factory fuel line or custom fuel lines. Supports fuel flow up to 1,000 Horsepower. 1/8 NPT Port included for nitrous pick up or fuel pressure gauge. A custom fuel line fitting is included for the factory fuel line, and the ends of each rail are pre tapped to accept -6 AN or 9/16”x18 fittings for users who want to use custom fuel lines. AEM's Honda/Acura Adjustable Fuel Pressure Regulators are capable of supporting enough fuel flow for engines up to 1000 horsepower. AEM includes a custom barb fitting to accommodate the factory fuel hose and the base of each regulator is tapped to accept a -6 AN or 9/16”x18 fittings. AEM's Honda/Acura Adjustable Fuel Pressure Regulators are capable of supporting enough fuel flow for engines up to 1000 horsepower. 1993-1997 Honda Del Sol VTEC - B16A2, B16A3 Engines. 1999-2000 Honda Civic Si - B16A2, B16A3 Engines. 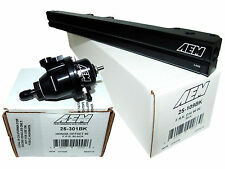 AEM 25-103BK. Works with factory fuel line or custom fuel lines. Supports fuel flow up to 1,000 Horsepower. CNC-machined from 6061-T6 billet aluminum Mounts directly to O.E. fuel rail or AEM High Volume Fuel Rail Patented interchangeable discharge orifices match output of virtually any fuel pump Accept a -6 AN or 9/16?x18 fittings Adjustable from 20 psi to maximum fuel pump capacity Interchangeable discharge ports match regulator output to output of any fuel pump No additional parts required for installation Manufactured and assembled in the USA Patent # 6,298,828 Application: 1996-2000 Honda Civic EX 1.6 Liter VTEC 1997 Acura CL 2.2 Liter 1994-1997 Honda Accord DX LX SE EX 2.2 Liter Disclaimers: Images in most cases are for display purposes only. Please read carefully about the product before buying, and contact us if you have any questions. **RETURNS POLICY** Inline Four understands that not every purchase is a good fit for every customer. AEM Electronics. 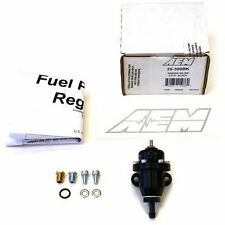 AEM Adjustable Fuel Pressure Regulators can support enough fuel flow for engines up to 1000 horsepower. This unit is tapped to accept -6AN or 9/16" x 18 fittings and includes a 1/8" NPT port for a fuel pressure gauge or pressure sensor pickup.